Stirling Cave: a surprising cave for few divers. Kev's Cave and Jan's Tunnel: varied depths and capricious rocks. Southern quarter of the Poor Knights Islands. 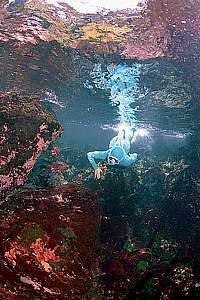 Red Baron Caves are found just around Kahawai Point. 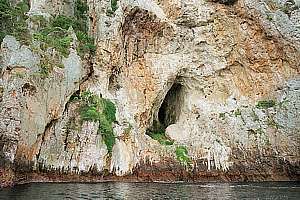 The main cave consists of a chamber connected to an almost vertical shaft that continues above water in the belly of the island. One needs a torch to enter and to be at ease. The name Red Baron probably comes from celebrated and feared World War I fighter pilot Baron Manfred von Richthofen who was shot down in 1918. Inside the cave one can imagine being a fighter pilot, arms spread wide and sailing by gravity down the steeply sloping shaft, a whopping 35m of it, maneuvering around blocks and through small holes, from dark to light to dark. Yeeehah! But there is not just one shaft as I found seven different ones, and there could even be more - a nice mapping project for a dive club! 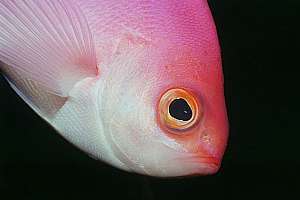 At the bottom of the cave, one finds oneself in the deep reef habitat which normally begins at 40m. From there it is but a small swim towards Kahawai Point where schooling fish abound. 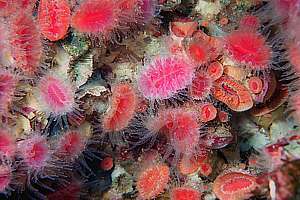 But even making way to the surface outside the main cave, one can enjoy the very rich life on the dark wall. Bring a good torch! f012100: the dark rock face of Barren Arch gets some sunlight in the evening. Notice the many vertical volcanic shafts. The promontory is Kahawai Pt, and Serpent Rock is visible in the distance. f216513: one would never guess a complex cave system hiding behind this rock, exposed at low tide. There are at least 6 and perhaps as many as 8 shafts. f052437: there is more to see than just caves, as the dark walls are inhabited by rich sedentary life, like this green sponge. f036503: one does not need to go very deep to meet the fauna of the deep. 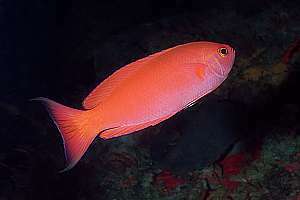 At 30m depth, one can meet abundant pink maomao and the rare splendid perch (Callanthias australis). The photo shows a young female splendid perch. f216619: rock formations above The Chimney, near Red Baron Caves. 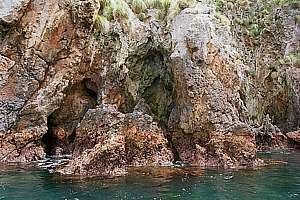 In the very corner north of Oculina Point one finds Stirling Cave (named after the owner of the dive shop Stirling Dive in Auckland), with little difficulty. Its entrance is some 7m wide and 4m high above a white sandy bottom at 15m. Immediately behind extends a taller room and here is where the fun begins. Straight in the back a small exit leads to another room, and in the same line another exit, now much smaller and narrower. From here on only two divers are safe, since more divers could cause congestion and danger. The light disappears, thus going any further requires precautions: a good torch and backup and a compass for shooting the exit with. The tunnel widens and narrows as it penetrates some 30m into the volcanic rock. Its ceiling narrowing to a crevasse. But it has mysteries. First of all, the tunnel descends from 15m to 23m, which is unusual for sea caves and tunnels. The bottom is fine virgin-white coral sand with ripples, meaning that water moves in and out, and that it must have an exit rather than a dead end. Towards the end the hard ceiling changes into soft clay, which is very unusual, suggesting an influence of fresh water running along the ceiling. At the very end the cold sea water abruptly changes to cold green fresh water inside a large chamber of unknown size and height, but very much larger than the tunnel itself. Its bottom consists of rounded limestone deposits with a yellow-golden veneer. Visibility is near-zero and one easily loses direction (hence the need of a compass). The green water suggests that the cauldron opens up into sunlight above, allowing for a dense plankton bloom inside. Let me know of further discoveries. 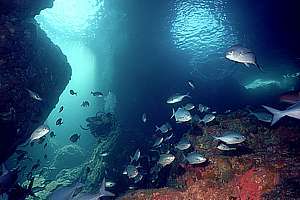 When dive charters do Jan's Tunnel, they anchor close to Kev's Cave (named after a New Plymouth diver Kevin Gunn), and a visit becomes mandatory. Kev's Cave is a small rocky overhang at shallow depth (3m), with an air bubble inside. 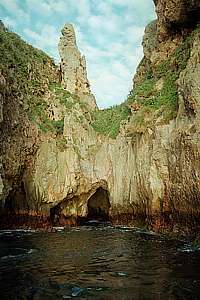 Outside the cave extends a steep wall of capricious rocks with small caves and swim-throughs, to a depth of nearly 40m on smooth sand. Boats can safely anchor here at 40m depth. 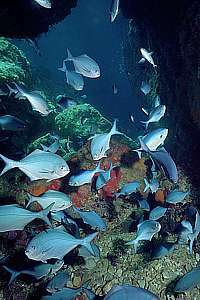 The cavities are home to a large variety of fish (who sleep here) and invertebrates. As one proceeds further south, the sandy bottom comes up as a steep river of sand, narrowing towards Jan's Tunnel. Jan's Tunnel (named after Jan Doak) is wide enough to let a small boat pass, but its ceiling comes down to prohibit this. 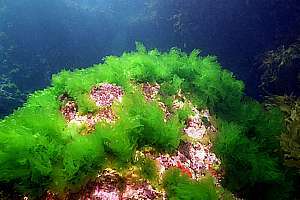 Only a few metres deep, it does not provide much life, except for spectacularly fat horse anemones and white anemones on its southern side. Inside, the cave widens somewhat into a kind of enclosed rockpool with amphitheatre and another exit out under the natural bridge. However, since landing is prohibited, this path cannot be taken. The cave turns sharp left with further forks. The inside of Jan's Tunnel is sheltered most of the time, and is used by fish as a sleepover. Blue-flippered penguins find a way out of the sea and up the sloping ground that is riddled with bird burrows. 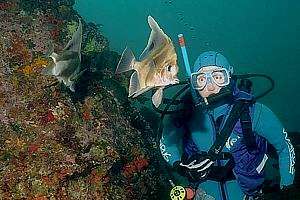 In front of the cave one finds a confusing configuration of peaks and passages, all very interesting, as one can also make a deep dive towards undivable depths, to find rich encrustations and the affable longfinned boarfish. 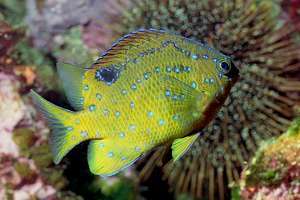 During the dive one will most likely be buzzed by schooling fish. However, all this pales to a night dive done here. The place is busy with sleeping fish and night predators, all spectacular subjects for underwater photographers. f020600: view of Jan's Tunnel from the outside. Note the jagged rocks. 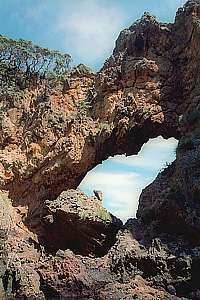 f990210: view of the natural bridge, looking south from inside Jan's Tunnel. f012034: this picture shows why the horse anemones in Jan's Tunnel are so big and healthy. They are just in the right place to catch plankton shrimps, here seen as white dashes. f038617: a pair of longfinned boarfish come inquisitively near, as interest is mutual. The promontory that extends out from Jan's Tunnel is riddled with passages, some of which can be swum through, and others clambered through. But they are difficult to find - mapping them could be a nice project for a dive club. The most visited one descends in a bath tub-sized pool, the exit of which is not visible until one is 2m down and right in front. 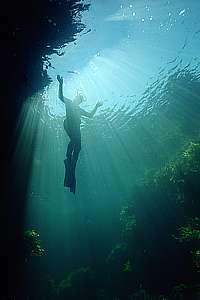 From here one can swim the 10-15m under water to where the cave widens and a breath can be taken. The cave exits on the other side. Although the reverse direction can also be done, it requires one to swim into a dark hole without a clear exit. 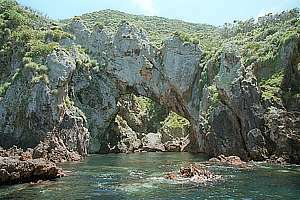 In the rocky area underneath and in front of the natural bridge is one of the most beautiful snorkel spots of the Knights, but it works only around high tide when one can easily swim over obstructing rocks. This place has many challenges and swim-throughs in a most beautiful setting. 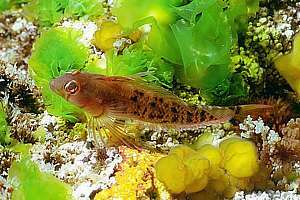 On the barren rocks one can encounter a number of triplefins like the obscure cryptic triplefin (Cryptichthys jojettae) and the Yaldwyn's triplefin (Notoclinops yaldwyni). 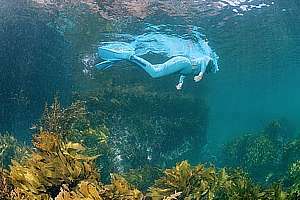 Snorkelling does not need to end here as one can swim into the shallows of Labrid Channel and across the channel to Ngaio Rock. In the channel is a sandy patch where in the months October and November, long-tailed stingrays can be found. f218829: you are looking at one of the most adventurous snorkel experiences at the Poor Knight. This promontory is riddled with passages to the other side, exiting next to Jan's Tunnel. There are at least two that require you to dive into a narrow pool and exit, to swim some 15m underwater, surfacing in a cave with another exit. f218827: the natural bridge seen from the outside towards Jan's Tunnel's inner sanctum. This photo joins on to the one on left. 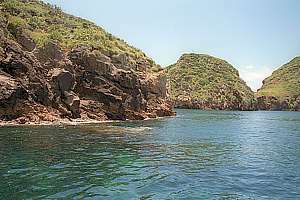 This is a most adventurous snorkel area at high tide, with swim-throughs, boulders and deep holes. It is a safe place for small fish. f218831: this photo continues from the one top left, showing the labrid channel and Archway Island. Blue Maomao Arch is just obscured. The snorkel area continues around the point into Labrid Channel. f218832: dive charter boats have taken refuge in Ngaio Bay. 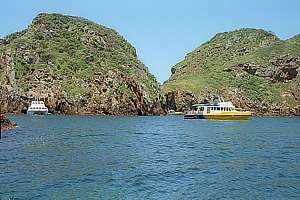 The white Pacific Hideaway has divers in Blue Maomao Arch, the yellow one in front is anchored above a sandy spot for a dive in Labrid Channel. f038502: the pool in front of the natural bridge is very beautiful. It is one of the best snorkel spots on the Knights. f041534: various species of seaweed growing in random profusion because living conditions are good for all. f033116: a half year young black angelfish (Parma alboscapularis) does not look like its parents at all, as this photo shows. When younger still, they look entirely different again. How did evolution do this? f034513: the cryptic triplefin (Cryptichthys joyettae) is difficult to see and to find, as it prefers wave-washed rocks. This is a female. 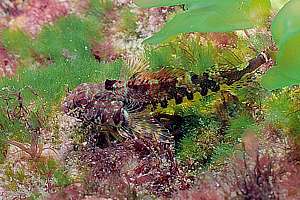 f033108: a female Yaldwyn's triplefin in spawning colours. Normally these fish are rather bland, with two rows of small spots on either side. They can best be recognised by their orange eyes. 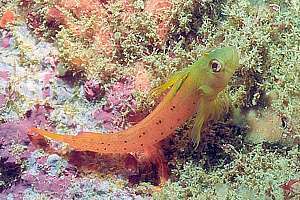 f033734: a male Yaldwyn's triplefin (Notoclinops yaldwyni) in spawning colours has an almost green head and orange body, and always orange eyes. 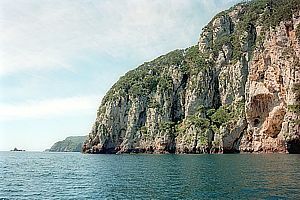 Ngaio Rock stands as a sentinel in the way of the passage to South Harbour (Labrid Channel). 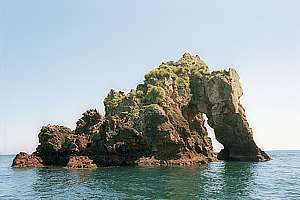 The rock formations seen above the surface reveal somewhat that it differs from the surrounding rocks, being part of the capricious rock formation south of Oculina Point, with many caves and swim-throughs. 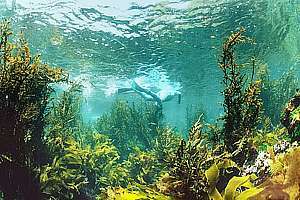 A snorkeldive around Ngaio Rock can therefore not disappoint, and so does diving here. 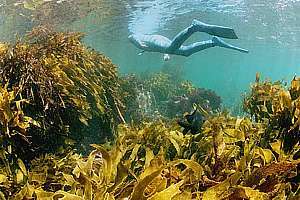 Between Ngaio Rock and Archway Island extends an expanse of kelp, interrupted by sandy patches, safe for anchorning. The bay here is very sheltered from easterly swell, and Blue Maomao Arch can easily be reached from here. f218836: the eastern side of Ngaio Rock shows how capricious the rocks are, with swim-trhoughs and small coves, a paradise for photographers and fish. To the right outside the photo is a submerged rock, nasty for boats but beautiful for diving. f023010: a snorkel diver at the capricious walls and passages of Ngaio Rock. 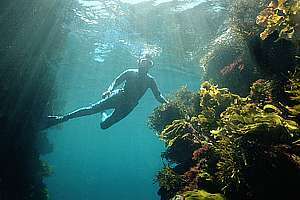 f023025: a snorkeldiver swims through a passage between lush green sea lettuce. f023004: another passage of Ngaio Rock, of which there are many. f023017: around the southern end, the sun can be hidden out of sight, casting beautiful cathedral light. f038519: a snorkeldiver descending in a dark spot where seaweeds can't grow, in the shade of the Natural Bridge. 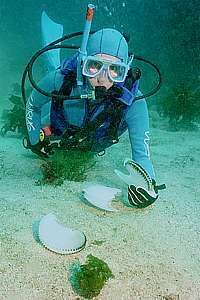 f038537: a snorkeldiver finds precious paper nautilus shells in a hole under the Batural Bridge(Argonauta nodosa). 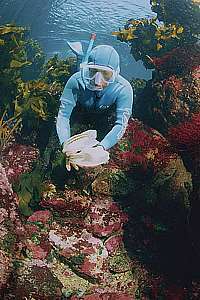 f038611: a scuba diver finds paper nautilus shells (Argonauta nodosa) on the sandy bottom of sheltered Ngaio Bay. Labrid Channel, named after the many wrasses (labrids) found there, is no longer what it used to be. There is a sandy river running all the way from Ngaio Bay to the other end of South Harbour. Boulders stack from the sand up the slope to the sheer cliffs around. 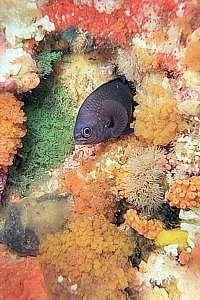 Shallow sand is a very productive habitat, as judged by the fish it attracts. One may see many fish in the archways, but these are like hotels, only for sleeping. Labrid Channel on the other hand, is a busy city street, for the daily business of living. I can still vividly remember how it used to be, watching the goings-on, while decompressing off the anchor chain. 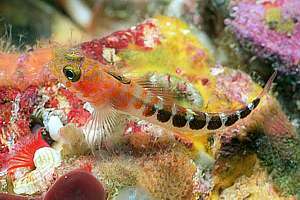 There were many goatfish back then, on the channel and on the sand in between the boulders. Schools of koheru were occupying the mid water, together with leatherjackets attacking the many kinds of jellyfish floating by. The barren rocks were fought over by untold many black angelfish who prefer their vertical sides, and male demoiselles fighting for territories on top, no bigger than an outstretched hand. These were mature males, deep blue with white forked tails. Their females were hanging in mid water, now and then descending to lay their eggs - continuous streams of fish going for the blue and returning. There were lots of wrasses, the young Sandagers wrasses fossicking around and doing a lot of demoiselle-cleaning. There were crimson cleaners galore, most sought after for their cleaning services. The bigger wrasses were continually raiding both demoiselles nests as well as those of the black angelfish. There was so much going on, that my camera was always too late to record it on film. And Blue Maomao Arch? 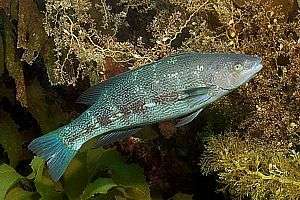 It was chockfull of large blue fish with the occasional wrasse. 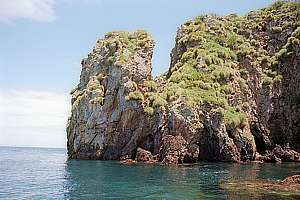 A large spotted grouper lived in a small cave at its western entrance, and two smaller ones lived under the very large rock in the middle. Where has all that life gone? When did I last see a crimson cleaner? A goatfish? Where are the young wrasses? Where are the barren rocks, covered in sea urchins? Where have the many butterfish gone? When did I last see a baby butterfish? Where are the mature demoiselles? The mature koheru, blue maomao and trevally? We're now talking about a substantial loss of life that happened in the past twenty years. Read Going, going, gone for more on this. A word of warning: sometimes there can be a stiff current running through Labrid Channel, a current that is entirely unpredictable and may well be caused by swirling eddies, branching off from the East Auckland Current. f041528: in the shallows of Labrid Channel, one can still have a good snorkeldive because the cliffs are a mere 6m deep and there is a lot of territory shallower than 10m. f051528: South Harbour is of course on the dark side, and that makes the fringe of seaweeds above the drop-off, so interesting. 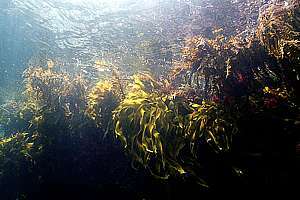 Here the flapjack bladderwrack and the yellow strapkelp are competing for space. f051525: one symptom of degradation is that there is too much food for too few grazers. In a healthy environment, this rock would have been barren, with demoiselles nesting on top. As the food is not eaten, it rots away. f020617: a very old goatfish has found a little cave in the middle of Labrid Channel, probably dug out by himself. 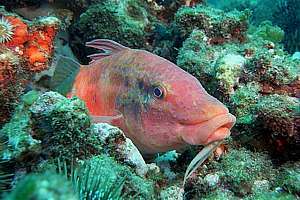 Although goatfish do not live long on average, the odd individual may attain 30 years. 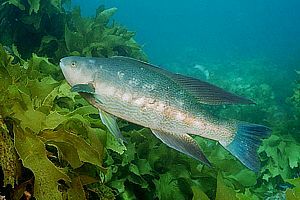 f051520: the female butterfish (Odax pullus) is grey-greenish with a dark side line. f051515: the male butterfish (Odax pullus) has longer fins and a white stripe. Old males can be beautifully painted with blue. 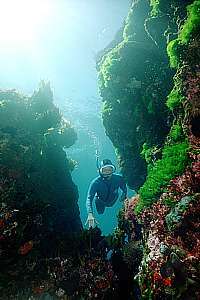 Blue Maomao Arch is a favourite dive spot because it is so interesting while entirely safe to dive. 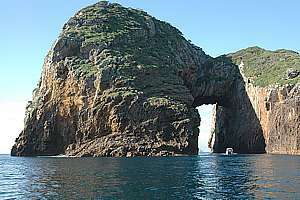 The archway faces east as part of Archway Island, which means that it can often not be dived on during heavy easterly swell. 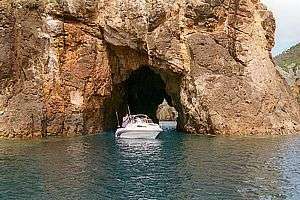 It is a narrow archway but a small boat could effortlessly travel through. 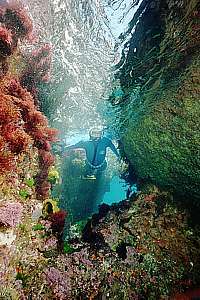 Dive charters anchor either near its western entrance, on the 18m deep sand of Labrid Channel, or on its eastern entrance over 25m of bottom depth. The western entrance has a rock that one can dive under or swim over. To the left, hidden from view a small cavern going up. Further to the left is a 'window', an entrance that begins above water. In the middle of the cave sits a very large boulder, with good hiding space underneath. It is in this darkest inner sanctum that schools of blue maomao hug the southern wall. Although the bottom of the cave is rather barren, its sides are extraordinary rich in fragile life: hydroids, bryozoans, sponges, anemones and so on. 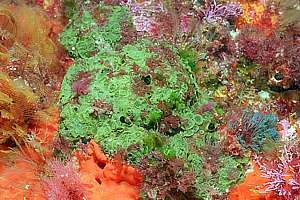 For this reason a night dive, ten nightdives, hundred nightdives are never enough as each brings something new in an ever changing environment. 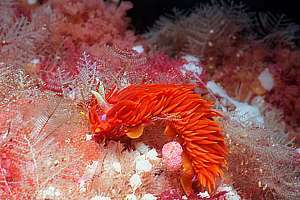 One year sees a lot of tambja nudibranchs, the next year a rare fire slug. But some things remain. 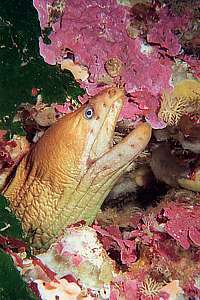 There is a very old toadstool grouper who is also very shy, and although in the open only by night, is still difficult to take a photo of. 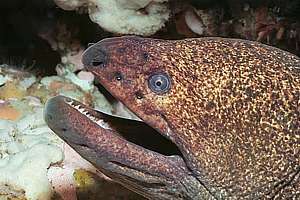 And there is a large speckled moray eel, also very large and site-persistent. f213307: a small boat is anchored in the eastern entrance of Blue Maomao Arch. This is a very convenient spot, but may hinder other divers. For doing a night dive, however, ideal. f038013: is this large speckled moray (Gymnothorax obesus) a permanent fixture of Blue Maomao Arch? Time will tell, but for now I've known him for twenty years. f023115: young blue maomao by day in the very spot where over one hundred will be by night. f019323: a young yellow moray eel (Gymnothorax prasinus) is active by night. f012528: a male demoiselle has found a bunk amongst the sensitive life on the southern wall. f023124: a diver enters the northern entrance. On right the 'window' and another one. In the foreground the barren bottom. f019315: cup corals (Flabellum rubrum) are fully open by night, catching zooplankton. f037905: rare slugs like the fireslug (Janolus ignis) can be common during certain years. One can meet it only during night dives, well into the night. 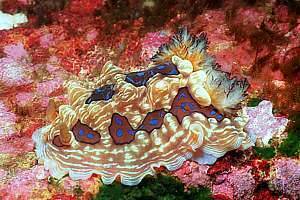 f037835: the gem nudibranch (Dendrodoris dennisoni) is one of New Zealand's more common sea slugs, but it too may be rare in certain years. The Tunnel is a large and long tunnel traversing the entire Arorangaia Island. On its eastern side it bears the brunt of storms and incessant swell, and it is of course deep, becoming shallower to a depth of 20m at South Harbour. By that time, waves have lost their power, and it so happens that the western entrance is actually quite sheltered. But there is practically no shallow bottom to anchor on. The cliff dwellers in this tunnel change from one end to the other, as would be expected for a gradient in wave wash exposure. 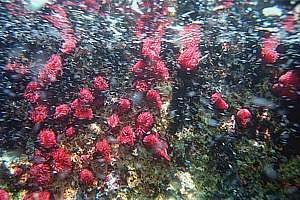 The bottom is covered in large boulders, on which one finds quite exuberant sponge life. Perhaps Blue Maomao Arch was once like this, before divers found it? f051319: pink maomao have a sleep-out alcove about 20m in from its western entrance, at 10m depth. This photo was taken with a 100mm macro lens, by day. f048115: the blue-dot triplefin (Notoclinops caerulepunctus) is only 3-4cm small, and is found where the pink maomao sleep. It used to be reasonably common. Shaft cave is so strange that it is worth visiting when the swell allows this. A small boat can enter and turn inside. The cave itself is a non event and rather barren for diving, but when looking up, one cannot suppress a queezy feeling of vertigo, for the shaft seems to end at Saint Peter's gates - it seems that tall. Only during mid day in summer, will the sun shine straight down into the blue water, setting the cave aglow in an eerie blue light for a precious few minutes, well worth waiting for. The Southern Archway is steep and deep and exposed on all sides. Yet in earlier days, one could find a lot of juvenile fish here. On the outside, the cliff face drops steeply to undivable depths. For visitors this archway is a dazzling experience, as it seems quite small from a distance. But by the time the boat passes underneath the natural bridge, it has grown into an awesome giant. 0701127: Southern Archway dwarfs a 7m runabout. It is huge. Look at its sheer walls. In the distance just a tip of Sugarloaf Island.